In less than a month, there will be the 10-year anniversary of Qoya classes in the world. I'm in awe at the depth of connection that has been catalyzed through people choosing to remember their essence through movement, embody their wise, wild and free nature, honor life with reverence in ritual, build and support communities of women where they live, encourage people to listen to the truth they feel in their bones, take pilgrimages to inspire the spirit, and awaken to the call to create. Thousands of classes have taken place taught by hundreds of teachers in dozens of countries around this world. In moments of celebration, I also wonder what could have been done differently or better? When you look at your life's accomplishments, are you able to celebrate and also contemplate at the same time? In Qoya classes, we do a shadow contrast dance that explores the opposite of the theme, and the essence of its value is understanding your own willingness to look. Are you willing to look at what might be uncomfortable because you trust your own integrity that is committed to realigning, reassessing, and recalibrating again and again? Can you see the bigger picture beyond your own personal narrative? Can you connect the dots between the profound moments of transformation and seemingly insignificant events that make up each one of our lives? Is it possible for you to honor the pure potential of fullness in each moment to access the infinite truth of source that animates whatever is happening right now? If you are open and willing to look, it seems like this new moon could be a great time to dive in. 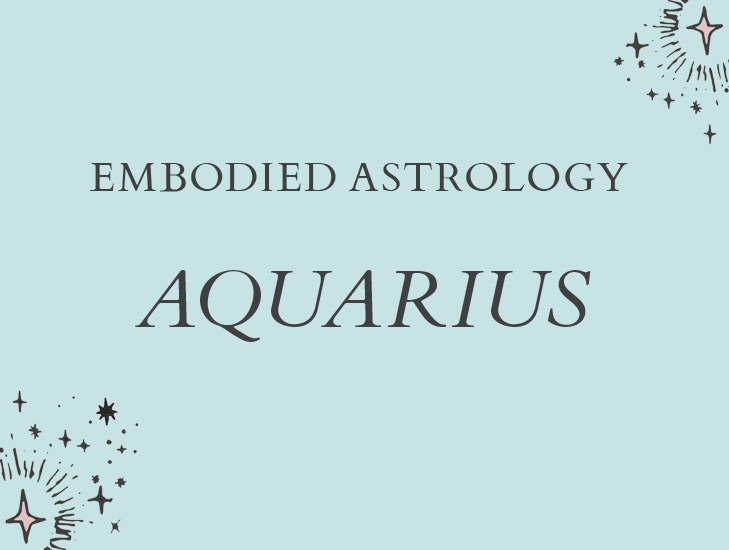 The New Moon in Aquarius on February 4, 2019 (4:03pm EST) is a bird’s eye view. Step back. Zoom out. Weird your senses. Occupy your sight as if you were in flight. With a stark clarity looking from above, gaze down at the state of the world. What do you see? What part do you play? Watch yourself doing your daily life, the zig-zagging geometry of your path over the years. What lands are you traversing? What are you upholding? What are you serving? We are all members of something. Consider your memberships. It is said that we belong to all the influences that comprise our lives. From the food that you eat to the media you consume, what memberships are you holding just by being, living, buying? What programs are you running? There's a collective consciousness, a consensus reality, behind all that we interface with. A matrix is a pattern, a context within which we develop. The word ‘matrix’ comes from ‘mother womb.’ Enculturated, we grow and adapt from the cellular structures and relational web that surround us. We are integral aspects of this web. We reproduce it and evolve it further. We are in it, we are of it, and yet we are distinct from it. We are divergent. Genius in our genus. Influential in our wakefulness. Brilliant in our betrayal. Free to challenge, disrupt, and reform anything untrue to our humanity. New Moon, New Program. Wherever we are frozen, we can warm with the light of love. Wherever we are numb, we can reinvigorate with our attentive experimentations. Wherever we are barren, we can share our gifts. No longer about accomplishment, the focus now comes on how we can be accomplices. Each of us elements of an ultimate organism, let’s bind “our creative constituent elements together" (Blain Bovee). Chain-breaking, eminent in our interweavings, love-making through our irreverent becomings. Each breath new, worlds blooming between us. Qoya is based on the idea that through movement, we remember. Through movement, we are able to remember our essence is inherently wise, wild and free. A physical sensation of truth emanates through our bones and breath that feels like resonance. I wish for you to feel the clarity of your vision and trust your capacity to rise up out of the momentum tunnel of daily life to remember your soul's original intent. To know beyond manifestation, your soul desires to PARTICIPATE in life, offering your unique energies and capacities to it. I offer this movement and meditation to support you, and hope that you are able to make time to honor yourself and create a ritual this new moon that resonates with your spirit. One powerful way to raise your gaze is to literally look up!! In addition to looking up, practice raising your consciousness up to connect with the brightest star in the sky you can see or that you can imagine. As you connect with that star, invite from the purest place in your own heart for your higher self to come and dance with you for a few minutes, and ask for the support you need to see your life, your goals, your dreams with more awareness of the big picture. When your dance is complete, practice a few minutes of stillness in meditation, a comfortable stretching pose or deep relaxation. Keep a journal by you to write down anything that inspires you on your path. For extra support, consider getting some lotus tea to drink and notice how it supports you to vision beyond the ordinary. I love Egyptian Blue Lotus and the lotus tea from Mountain Rose Herbs. *To begin, get a piece of paper or journal close by to write down anything that comes that you want to remember. *For extra support to vision, consider drinking some Egyptian Blue Lotus or lotus leaf tea to support a more expansive perception. 1) Set up this video, Set an Intention to Connect with Your Higher Self, where you can look up at the sky! As you dance along with the video, keep looking up and reaching up to call in support from your highest self to guide you. 2) Feel if a certain song comes to you clearly that you would love to dance to, or put your songs on shuffle and invite your higher self to dance with you and offer any visionary support. You can mute the video to dance along with me while listening to your own music, or just dance on your own. In Qoya, there's no way you can do it wrong and the way you know you're doing it right is that it feels good to you! 3) Come to stillness and rest. You could be in a stretch, a meditation pose, or just lie down and relax. Take time here to quiet your mind, and listen for any messages to come through your raised awareness. If something helpful arises, great! If not, celebrate your willingness to look and keep asking. Believe in the possibility of being able to see the bigger picture, source energy from the highest potential, and participate fully in the flow of what is happening now. In March, Qoya teachers all over the world will be offering a special 10 Year Anniversary Qoya class! Dates and locations will be announced towards the end of February, so stay tuned! 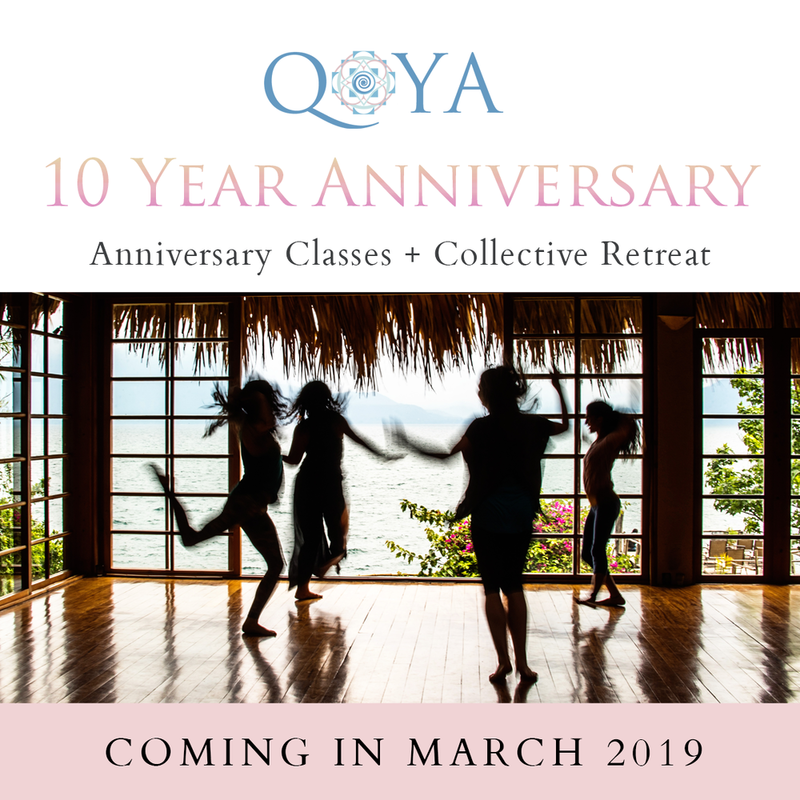 You can can also come celebrate the 10-year anniversary of Qoya this March 23 - 30 at Qoya Collective Retreat in Costa Rica. This year, we'll be exploring CONNECTION - to other people, to nature and the world around you, to spirit, and most of all, connection to yourself and to the sensations in your body. In a true Aquarian spirit that focuses on the Collective, I'm honored to be a part of a new collaborative book with over 20 authors published by Flower of Life Press titled Sacred Body Wisdom: Igniting the Flame of Our Divine Humanity. This powerful and transformative collection of essays contains vulnerable stories, wisdom, and reflections on how we can create an authentic relationship with our body as a portal into deeper evolution, empowerment, and change. To continue diving into the energy of this Aquarius moon, you may also be inspired to check out the Embodied Astrology: Aquarius course which includes an introductory video to give you an overview of Aquarius's aspects, a Qoya Movement Ritual so you can embody your own personal relationship to Aquarius, an integration video with an exercise to apply in your life, worksheets with journal prompts, and a blessing for deep reflection.